Powers/Abilities: The colonists did not demonstrate any superhuman powers. Traits: Little is known about their parent race, but the colonists resented the hard work of farming they were forced to endure. Willing to trust someone who offered them an out, they were nonetheless resentful upon getting shafted. (Deadpool IV#34 (fb) - BTS) - An unidentified race established a colony of terra-farmers on the planet Urrulu. (Deadpool IV#34 (fb) - BTS) - Over time, the grandchildren of the original colonists, now numbering around 1000, resented the hard work of farming on an inhospitable planet they were forced to endure. 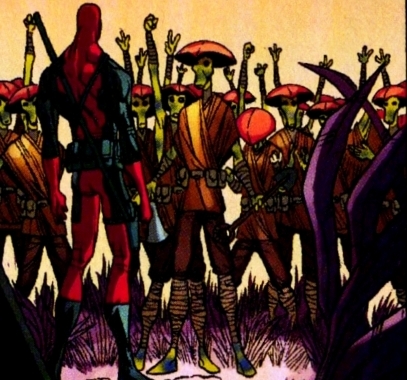 (Deadpool IV#34 - BTS) - Kak, commander of the last survivors of the Ongulian race (whose home planet and the rest of their fleet had been consumed by Id the selfish moon), predicted that Id would target Urrulu as it was populated (despite by a small number), which is what Id liked. Having hired Deadpool to destroy Id, Kak planned to have Deadpool destroy Id while Id was distracted in the process of shattering Urrulu. (Deadpool IV#34 - BTS) - Upon learning Kak's plan and that Kak was willing to sacrifice the colonists to save countless other worlds, Deadpool forced the Ongulians to change their plans to save the colonists on Urrulu. (Deadpool IV#34) - Deadpool spoke to the colonists, informing them that Id was coming to destroy Urrulu and that he would use the Ongulian ship to transport them somewhere cool. Unhappy with their current lot, the colonists cheerfully agreed...but first Deadpool forced them to carve a large message on Urrulu's surface for Id to see: "They're gone -- I'm the guy that did it" (surrounding a picture of Deadpool's symbol). The colonists were less happy, however, upon arriving on their new world, a frozen wasteland. Deadpool encouraged the colonists to blame the Ongulians helping to unload their freeze-dried food packets within an icy shelter; while one of the Ongulians futilely tried to appease the colonists by discussing the positives (a cave for shelter and freeze-dried food packets), Deadpool took the Ongulians' ship and left Kak and the other Ongulians with the angry colonists. (Deadpool IV#34) - As planned, Id was antagonized by the message, and he bypassed the frozen world of the former Urruluan colonists and the Ongulians, as there was neither happiness nor revelry there. 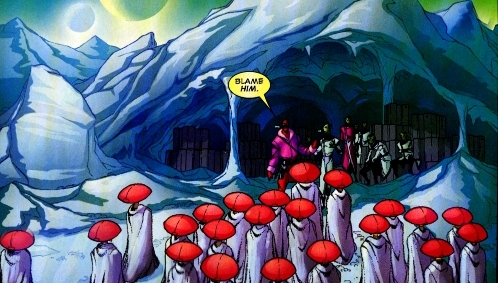 (Deadpool IV#35 - BTS) - The Ongulians were apparently recovered from the frozen planet; it is unrevealed whether the colonists were recovered and/or returned to Urrulu. (Deadpool IV#34 (fb) - BTS) - Over time, the grandchildren of the original colonists, now numbering around 1000, resented the hard work of farming on an inhospitable "rock" they were forced to endure. (Deadpool IV#34 - BTS) - Having hired Deadpool to destroy Id, Kak -- commander of the last survivors of the Ongulian race -- planned to have Deadpool destroy Id while Id was distracted in the process of shattering Urrulu. (Deadpool IV#34 - BTS) - Deadpool forced the Ongulians to change their plans to save the colonists on Urrulu. 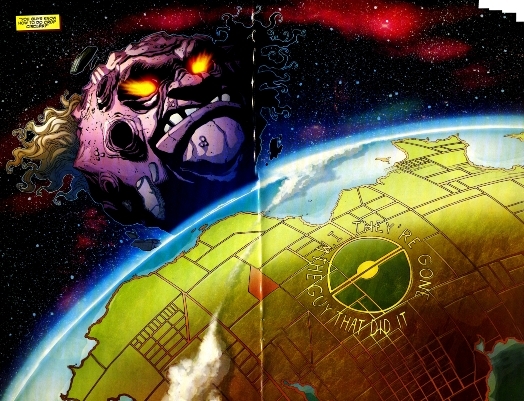 (Deadpool IV#34) - Deadpool easily convinced the colonists to leave Urrulu to escape Id; but first Deadpool forced them to carve a large message on Urrulu's surface for Id to see: "They're gone -- I'm the guy that did it" (surrounding a picture of Deadpool's symbol). (Deadpool IV#35 - BTS) - The Ongulians were apparently recovered from the frozen planet on which Deadpool had transported them and the former colonists of Urrulu; it is unrevealed whether the colonists were recovered and/or returned to Urrulu. 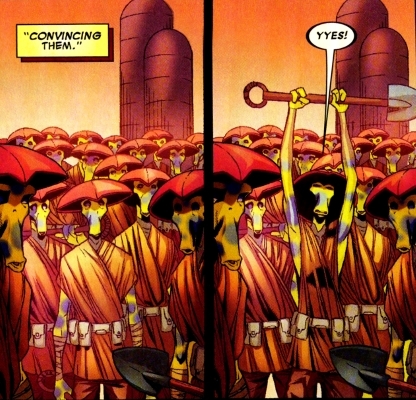 (Deadpool IV#34) - Having told the colonists of Urrulu he would take them someplace cool," he brought them here.